It is good to return to my blog. I have been on vacation, and before leaving, I decided I would stay away from blogging. It wasn’t difficult to do, within the environment surrounding me. I had a fantastic time wandering the Pacific Coast Highway, between Big Sur and the Monterey Peninsula, in California. My senses were filled with magnificent scenery, seascapes, cliff overviews, hiking, eating, watching whales and otters, visiting the Monterey Bay Aquarium, tasting my way through wine country, and so much more. There are a few books I recommend for those of you who want to learn more about the California coast, and for those contemplating traveling the coast. I have read them all. International Night: A Father and Daughter Cook Their Way Around the World, by Mark Kurlansky and Talia Kurlansky, peaked my interest and senses. I have finished reading this deliciously delightful book! I loved every sentence, and recipe. I found myself taken to other lands, and my senses were awakened through the salivating sounding recipes. From spices to herbs, and ingredients, I could not only see the recipe in written form, but could feel the textures within them, inhale the scents, and taste the finished appetizer, side dish, main course, and/or dessert. Mark Kurlansky and his daughter, Talia, set out on a journey around the world. The journey was taken through the trials and errors of the mastering of food for their Friday night dinners. He would spin a globe, Talia’s finger would find the country, and that would determine the Friday night meal. They shared a world adventure, not only in cultural diversity, but also in food. They achieved their ambitions through their preparations, cooking, and through tasting more bites than one. Their tummies smiled. Father and daughter have turned an idea into a family tradition. It has brought out the effects and affects of how ideas can lead to bonding, a deep bonding that will last through generations of cooking and dining delights. I will be trying a couple of recipes, and when I do, will update my review. I can imagine other readers enjoying the book as much as I did. Thank you to Goodreads for the complimentary Advanced Review Copy. International Night: A Father and Daughter Cook Their Way Around the World will be published August 19, 2014. Here I am, writing another review of a book written by Stefan Zweig. This one is entitled The Post Office Girl. It is a book that concerns a female postal clerk in a small town in Austria. Unexpected events occur that lead her back home. Once there she feels cheated, defeated, and feel entitled to the life led while on vacation. She feels out of place in a world healing from turmoil and political oppression. She takes it upon herself to travel to Vienna for a weekend getaway, and visits her sister and brother-in-law, also living in poverty. The Collected Stories of Stefan Zweig is a combined study on human behavior and Austrian life. Each story examines behavior, with great detail within the boundaries of Austria’s social standards and mores. The stories were not only period pieces, but social statements regarding ethics/morals, war and pacifism, and the living standards of the elite versus the poor. Most of the characters are depressed, stuck in a rote of life, and give off an aura of tragic lives lived. The stories are filled with melancholy and slices of drama. Drama played a major role in Austrian lives, and survival depended on roles played. Pacifism is conveyed in the story entitled “Compulsion“. It involves an artist who receives orders to go to the Austrian consulate. His back and forth indecisiveness reflects those who do not believe in war, yet also feel they should do their duty to their country. Should he go, should he stay, should he go? Religion factors into many of the stories, from Judaism to Catholicism. The individuals, family units and their beliefs are illuminated through Zweig’s writing. The details within the stories are masterful and filled with perfection. The reader is exposed to the psychology of living in Europe during tragic and uncertain times. This psychology includes the poverty stricken individual’s struggle to survive in a world that looks upon them as less than desirable. Their very psyche is affected, in every aspect. The bourgeois also strive to fit in. They feel somewhat above those who live in dire straights, but feel less confident than the well off elitists. The elitists don’t necessarily fare better within their financial circumstances. Each story is a page-turner in its own right. Some of the characters have life-altering events, along with physical limitations, mindsets and philosophies, ideals, fears and struggles. The stories are not connected. Yet they share a time and place of prewar and war, and the situations that result due to war’s impact on citizens and their lives. The stories cover the years from 1900 through 1935, with two additional stories having been unpublished until 1951 and 1987, respectively. This reader could see the author’s disintegration from society through the written prose. Zweig’s life was filled with disillusion, antiwar sentiment and a depressive state. When one has researched Zweig’s life, so much is apparent in his writing. His work conveys much of his own thoughts, opinions and emotions, vividly. At least this reader thought so. The film, The Grand Budapest Hotel is based on some of Zweig’s stories and novels. I can definitely see illuminations of that throughout this book. I have read two of his novels, but had not read this particular collection. The Post Office Girl is one of the novels, and the film is also based, in part, on this novel, according to the director, Wes Anderson. Stefan Zweig is brilliant and a masterful story teller. The reader is transported to Austrian life during the first three decades of the 20th century. The Collected Stories of Stefan Zweig is a valuable collection of works within one book. The historical value is priceless, and I found the book to be a masterpiece. The Museum of Extaordinary Things: A Novel, by Alice Hoffman, is filled with symbolism and analogies that she has filled the pages with. For instance, the character Eddie steals a watch from the young son of a wealthy family who owns the factory he works in. The boys were both adolescents. He carries the watch everywhere, and perceives it almost as if it was a good luck charm. As the years move forward and he matures into a successful photographer, the watch proves to be a burden, an oppressor in his life. Coralie is a young girl, the child of a self-proclaimed professor, who owns a museum, the Museum of Extraordinary Things. She was born with webbed-fingers, and her father never lets her forget she is less than worthy. She is more or less imprisoned in her house on Coney Island. She is eventually forced by her father to swim in the Hudson River at night, so others might perceive her to be a monster. He uses her to impersonate a mermaid, in order to entice customers. Coralie does become more self-confident, and realizes her father for what he is. He is a rigid and commanding person, and his “museum” is of utmost importance to him, more so than her importance is in his life. She becomes aware of his mistreatment of the individuals in his employment. Her father runs the gamut of searching for those who were born with severe birth defects. He is constantly looking in morgues, the Bowery, and anywhere that he feels “freaks of nature” (man, woman, child, animal), dead or alive can be found. He is a con artist, a scam maker, and uses others for his own purpose. He views each individual he uses in his museum as being less human. Yet, within the realm of those individuals are those who are astute and extremely intelligent. They are more or less forced into working in a side show of sorts, due to their appearance. Nobody else would have them. Coney Island was a home for the unfortunate with birth defects, and people flocked there to see them. Coney Island is described with minute detail. Hoffman is excellent in that respect, especially in showing daily life for those who struggle to survive. From the Jewish immigrants to the gangsters and mob bosses, the corrupt police and the fire department, the stories are all there, before the reader’s eyes. The history has been written about before, several times over, but she has weaved it into a tapestry of historical fiction that should appeal to many. From the tragic Triangle Fire to the Dreamland Fire, and more, events are illuminated through individuals and their daily lives. How tragedy affects them is well-defined. Tragedy can encompass more than a horrific event, and can be imposed by crass, unforgiving and uncaring individuals. It was an explosive time, a “dog eat dog” world of survival. The monsters of evil in life are not necessarily the “freaks of nature” within the pages of the novel. The reader is cognizant that human beings who show no compassion or humanity are often the misfits of life, the monsters. The novel is cleverly written. I found the historical aspect fascinating, even though I knew much of it beforehand. Some historical events are filled in with creative license, yet the major facts were retained. I liked the comparison of the “freaks of nature” with those who were born without birth defects. The reader’s senses are filled to overflowing with the sights, sounds, smells, tastes and touches of Coney Island. The Museum of Extraordinary Things is metaphor for life and assimilation in Brooklyn, and for the magical perceptions of Coney Island and Dreamland. Alice Hoffman is excellent with her word-imagery and details, leaving nothing unturned. There is a lot of symbolism within the pages detailing birth, life, and rebirth, burdens, and dependence. The horrors are on display constantly, and the horrors are not always the “misfits of life”. Coney Island, itself was the museum of the ordinary and extraordinary individuals who inhabited it in the early 20th century. Panic in a Suitcase, by Yelena Akhtiorskaya, is a novel that revolves around the Nasmertov family, who have emigrated from Odessa-one city by the sea, to Brighton Beach-another city by the sea. Brighton Beach was often called “Little Odessa”. The comfort level of the area is one reason the family chose the location. Word of homeland comforts spreads quickly, once an immigrant finds food, clothes, etc., that keep their remembrances at hand. An immigrant from Odessa could find anything that their homeland offered, in Brighton Beach. From food to furniture to household items to material goods, it could all be had. This very fact is what held the elders of the family within its fold. It is what prompted them to convince their son, Pasha, to emigrate from Odessa. Pasha, on the other hand, procrastinated, and waited until the last minute. This seemed to be typical behavior of his, throughout the novel. His role in the book is one of a man who doesn’t seem to be motivated by anything in life, positive or otherwise. He lags behind in everything. He doesn’t quite get the situation or the city he has arrived in, and has not desire to find out the aspects of life within the realm of Brighton Beach. The story deals with the way that life is perceived during a time of assimilation. It brings the reader snippets of the procedures to assimilate, and also yearnings for what once was in the homeland. The desire for change does not necessarily overrule the comfort of what the homeland held in a person’s daily life. The reader is taken on a twenty-year journey through the Nasmertov family’s treks to fit in, to understand the cultural divide between homeland and their new land. The journey is humorous at times, but only to the extent of familial actions, and also how they are viewed by those around them. The humor is more of an enhancement of what it means to survive in a country so unlike the one you emigrated from. Yelena Akhtiorskaya’s debut novel is filled with descriptions of Coney Island and Brighton Beach, that one can capture through their five senses. The novel is also an examination of the immigrant and the experiences and endeavors to fit in, despite strong memories of the past. I enjoyed reading about the cultural issues, and enjoyed the word-imagery regarding the beach cities and the surrounding environs. I am posting this, once again, almost two months after originally posting it. Thoughts of my father and his war involvement are on my mind, for some reason. 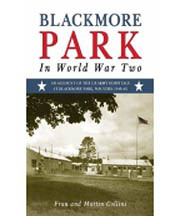 Blackmore Park In World War II, by Fran and Martin Collins. My father served in World War II, and was deployed to Blackmore Park, Malvern, which is in England. He was there for several months before being deployed from there to other areas in Europe…Belgium, Germany, and Italy. It was an estate which was used for U.S. Army Medical Corp during the war. Blackmore Park In World War II is an inspiring look at how Blackmore Park became a sanctuary, of sorts, for those who were wounded during World War II. The men and women who strove to help others through their immense efforts were individuals who put others first.